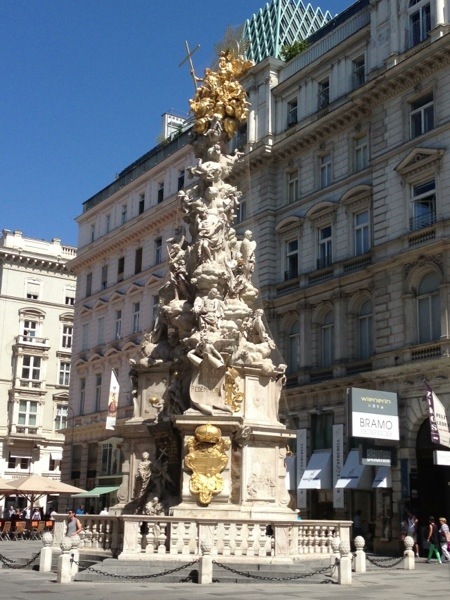 The Pestsäule is one of the most notable pieces of sculpture in Vienna and is located on Der Graben. This work of art is Vienna’s tribute to those who fell victim to the bubonic plague in 1679. It is said that Emperor Leopold I promised to erect a spectacular column in the heart of the city as a symbol of gratitude, after the destructive wave of epidemics had ended. It features figures of the Holy Trinity and nine angel choirs. The city authorities asked Matthias Rauchmiller to do the marble works, but he never managed to finish more than several figures before he died. This is only one of many great sculptures in a city full of artists and muses. Happy travels Will. I hope to follow in your footsteps next year with both Budapest and Vienna on the itinerary. Thank you Cinda. You will love this part of Europe. Cheers!